When playing from a greenside bunker it is vital to have your body aligned with the target even more so than other shots as you have an open stance. Here's a simple drill using alignment sticks to help get a consistent body position when playing the 10 to 15-yard bunker shot. 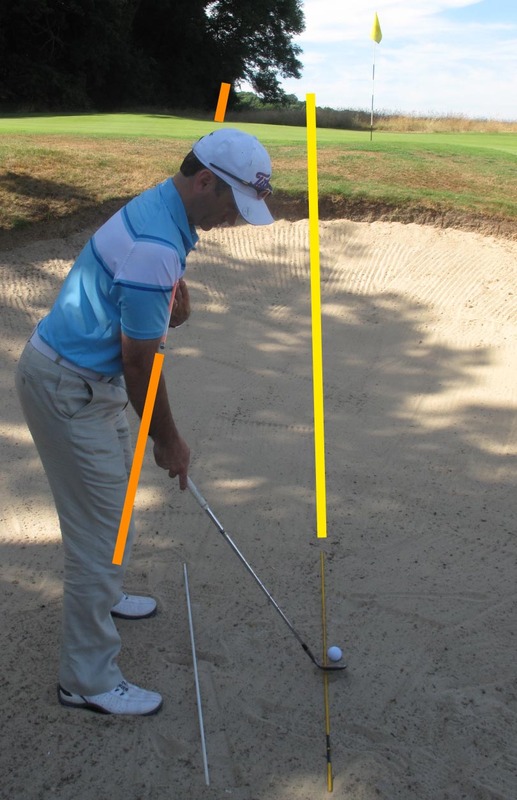 If you're in the middle of the bunker, set up with a slightly open stance as you can see in the image represented by the white alignment stick. The clubface will be slightly open if the green is raised and make sure the landing spot you're aiming for is allowing for roll towards the pin. Line this up with an alignment stick as seen by the yellow line. Then address the ball with your bottom hand while putting another alignment stick - orange in this case - across your chest to line up your shoulders up with the directional stick showing the line of the ball. Practice the shot a few times with one hand while still holding the stick. Once comfortable try the shot without any aids and see what the result is. This drill will get you used to having an open stance but still make sure your body is directing the ball towards the target.